Loyal readers of our blog will remember that we recently talked about Orange Lutheran High School and the wayfinding as well as directional signage products we prepared for them. These new markers perfectly suit the meticulous landscaping and campus setup. Yet the administration was not done with sprucing up the look of its property. Once again, the experts at Superior Signs and Graphics got the call to help with another sign. This time, we manufactured the types of vertical banners Orange County retailers and service providers have been using with excellent success. Vinyl Vertical Pillar Banners That Pop! At Orange Lutheran, the faculty and administration are preparing for the advent of summer. 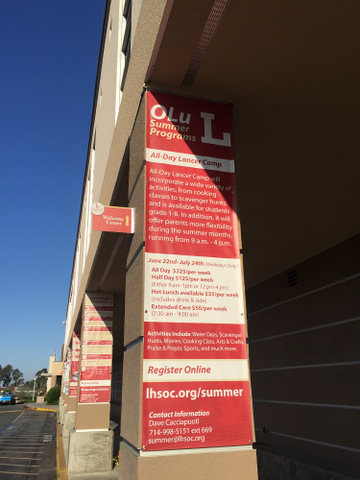 Although school will be out, there is a comprehensive summer program taking place on the school’s campus. 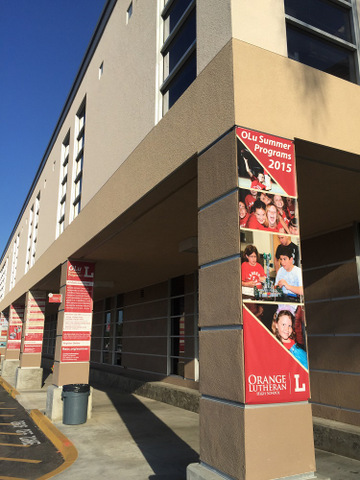 Ordering multiple pillar banners, Orange County’s famous Lutheran high school encourages students, their friends and visitors to consider this location as the fun in the sun time they can have. All-day camps keep kids occupied from 9 a.m. to 4 p.m., which is a great need for working parents. Fun activities include games, exploratory classes that introduce children to new hobbies and the opportunity to make great friends. The banners are red – in keeping with the school colors – and some feature the school’s name and logo. To highlight the availability of academic enrichment programs in addition to the summer camp, the school decided to give each banner a different look. This approach has proven successful for retailers in mall settings and is bound to have an excellent response here, too. 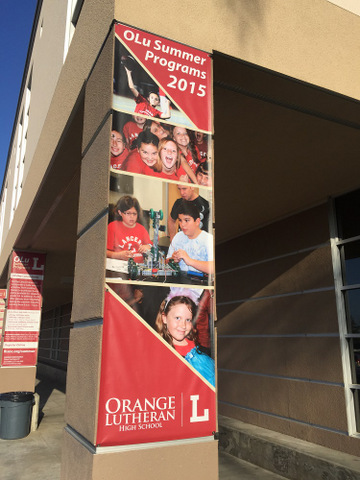 When you are ready to take a page from the playbook of Orange Lutheran High School, our professional signage experts can help you, too. Tons of space for information! Branding. No matter what images and lettering you select for your pillar banners, make sure that at least some of them feature your company’s name and logo. In addition, all of them should display your company colors. When you have multiple pillar to work with, consider commissioning a banner for each one. Marketing. A detailed marketing message is great. Breaking it up into multiple banners eliminates the need for small fonts. By logically categorizing your message, consumers read what they are interested in and skim over the rest. This prevents folks from just glancing at your messages. Attention getting. Pillar banners get attention. In an advertising landscape where the majority of signage products is horizontal, it is refreshing to find a visual counterpoint. Since plenty of venues feature columns, make good use of these vertical marketing surfaces. Seasonally suitable. These banners are ideal for your seasonal marketing efforts. They grab the eye, they stand out simply because they are rarely displayed and they offer you plenty of surface space to introduce new products, services or seasonal buying opportunities. In addition to all of these advantages, you also have the added benefit of working with signs that are durable. This allows you to reuse them again next year or when you run the next deep discount or parking lot sale. Call our signage experts today for more information on pillar banners and other marketing signage products.